Terms: The 15-year deal is traditional in that it involves a percentage of the gross and an investment by Aramark. It’s non-traditional in that it is “seamless,” offering clients a one-stop shop branded Ottawa Convention Centre, rather than dealing with various and multiple providers and contracts. Aramark will coordinate all event services, including catering, retail food and beverage and set up. Jennifer McCrary will serve as general manager of the Ottawa Convention Centre for Aramark. The most successful convention center operations they saw in North America and Europe were those that had a seamless relationship with service providers. The Ottawa Convention Centre will be that type of operation. The name Aramark will not be on the cups and contracts. 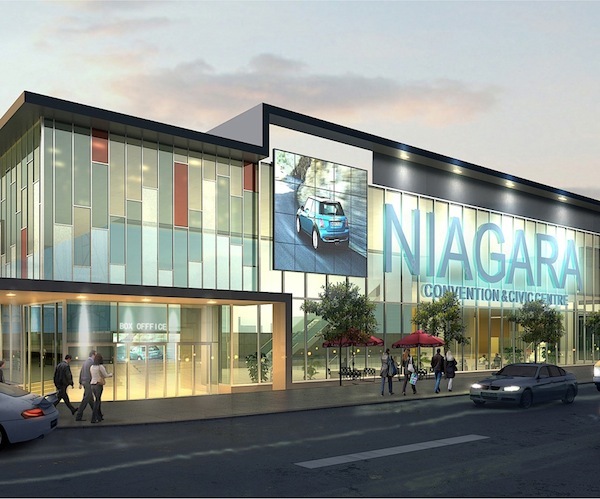 It will all be the Ottawa Convention Centre and McCrary, an Aramark employee, is titled general manager for facilities for the center. The OCC person will be the Aramark person. “It’s not just food and beverage; it’s delivery of services,” he emphasized. The convention center will do a projected 700-900 events annually, grossing $25 million in total revenue, including food and beverage, rental and ancillaries, Keough said. Aramark’s Dan Smith said McCrary moved to Ottawa from their Palm Beach (Fla.) Convention Center operation. She will coordinate all event services, from managing catering and retail food to overseeing plant management, including engineering and mechanical maintenance, housekeeping and grounds. Aramark also will be responsible for cleaning the facility’s exterior windows, consisting of 1,045 triangular window panes. Terms: Paciolan has signed an agreement with secondary ticket marketplace StubHub to enable fans to buy and digitally resell tickets to games at Purdue in West Lafayette, Ind, and Florida State in Tallahassee. The deal allows season-ticket holders to digitally list and sell their tickets on StubHub, while buyers can easily purchase tickets and print them at home, all digitally. The deal is the first of its kind for both companies and is similar to a StubHub deal in place for Major League Baseball, which Paciolan facilitates for both the Colorado Rockies and the Philadelphia Phillies. Paciolan Founder Jane Kleinberger said both Purdue and Florida State approached her about piloting the program after she announced the partnership at a recent PacNet user conference. Paciolan expects to add two more schools by the time basketball begins. Kleinberger said the partnership allows buyers to purchase tickets without worrying about fraud, while box offices are better equipped to deal with tickets that are purchased through StubHub and can provide better customer service. StubHub often lists tickets below face value for basketball and baseball, but Maged said that’s not necessarily the case for large conference football. Bi-Lo Center, Greenville, S.C., and Charter Amphitheatre, Simpsonville, S.C. Terms: The Greenville Arena District (GAD) assumed management from Centerplate, effective Sept. 1. GAD owns the 15,000-seat Bi-Lo Center and manages Charter Amphitheater at Heritage Park. Centerplate will continue to provide food and beverage service at Bi-Lo Center through an extension of its existing contract for 10 years from this year (2020) and will expand that concessions agreement to include the Charter Amphitheater in Heritage Park, which has 3,500 fixed seats and 11,700 lawn seats. GAD owns the Bi-Lo Center. The board is appointed by the state. Originally, under the management agreement with Centerplate, Centerplate was the backstop for the bonds that built Bi-Lo Center. When the Greenville Grrrowl hockey team left the building four years ago, those bonds, though paid, were technically in default because Centerplate was no longer obligated to be the backstop. Now, everything is back on track, Newton said, including addition of a new hockey team, the Greenville Road Warriors of the ECHL. That team, formerly the Johnstown (Pa.) Chiefs, begin play at Bi-Lo Center this season. GAD bought Centerplate’s management contract for $2.5 million, Newton confirmed. Centerplate had been paid $1 million a year in management fees. That contract was due to expire in September 2013. The concessions side is a percentage deal. Centerplate now pays 35 percent of the gross, down from 40 points before. Centerplate also added the Charter Amphitheater to its venues. It had been a Premier Events food contract. GAD took over the venue from SMG in February and has booked eight shows this season. Newton said it will probably end the year with 50,000 attendance. Per caps on concessions have been as high as $18 and average about $8, he said. The city added a VIP tent area this year, which offers an upscale menu and liquor and drinks.